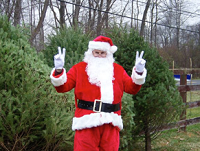 Central New Jersey Christmas Tree Farms: choose-and-cut Christmas trees, Tree lots with pre-cut trees, stands, sleigh rides, hay rides and related winter events and fun! Whether you want to cut your own tree, pick a live tree and have it cut for you, buy a tree already cut or buy a living tree you can plant, this page provides detailed listings of Central New Jersey's choose-and-cut Christmas tree farms, places to buy pre-cut (also called pre-harvested and fresh-cut) trees, stands, sleigh rides, hay rides and related winter events and fun. Some listings are for tree farms, others are tree lots, and some only offer hay rides, sleigh rides or other winter events. READ EACH LISTING to know what each facility offers. The farms are listed further down this page, so scroll down the page! Since this service is free and open to ALL Christmas tree farms, not just those who belong to an association or pay for an ad, like almost all other websites do, this is the most complete and current listing available! I'm always looking for more to add, and to correct any inaccuracies or errors, so if you encounter any, please email me ! And please tell the farmer you visit in Central New Jersey that you found their farm here! I need the farmers to realize that you found them here so that they will keep their information up to date! 300 Basin Road, Trenton, NJ. REGRETFULLY, AFTER 45 WONDERFUL HOLIDAY SEASONS, BEAR SWAMP CHRISTMAS TREE FARM IS CLOSED. Over the years, we've become part of a family tradition for so many of you and we cant thank all of you enough for that. We think our founder Sam Willard would be proud of the job we've done continuing what he started so long ago. Because of the patronage you provided, we made a small business successful for over 4 decades. 58 New Road, Lambertville, NJ 08530. Phone: 609-737-2178. Email: carolandphilc@yahoo.com. Open: Saturdays and Sundays from 10 am to 4 pm from the Saturday after Thanksgiving to December 23. Directions: From Route 295, take Exit 72 to Route 31 north, go 7 and a half miles. From Route 95, take Exit 4, Route 31 north, go 7 and a half miles. Turn left onto Route 518 west and take the second road on left, New Road. Farm is 1 mile on the left. Click here for a map and directions. Payment: Cash, Check. Tree baler provided and we'll tie your tree to your car. We're known for our homemade chocolate chip cookies. You-Choose and You-Cut varieties: Colorado Blue Spruce, Norway Spruce, White Spruce, White Fir (Concolor Fir), Fraser Fir. 900 Canal Road, Princeton, NJ 08540. Phone: 908-874-3237. Email: crgeckeler@aol.com. Open: The day after Thanksgiving until Christmas Eve from 9 am to 4 pm daily. Directions: From Princeton - North on Route 206, turn right on Rt 518 through Rocky Hill, turn left on Canal Road through Griggstown. Farm is at Canal and Butler Road. Click here for a map and directions. Payment: Cash, Check. You-Choose and You-Cut varieties: Colorado Blue Spruce, White Fir (Concolor Fir). 184 Sharon Road, Robbinsville, NJ 08691. Phone: 609-208-0784. Email: lazysusantreefarm@gmail.com. Open: Saturdays and Sundays, from Thanksgiving to Christmas, from 9 am to 5 pm. Directions: Click here for a map and directions. Payment: Cash, Check, credit cards. Handmade, custom-designed wreaths, made on our farm. Plus our popular and unique handmade Holly Wreath. Click here for our Facebook page. We have a large selection of beautiful FRESH CUT Douglas fir, Fraser fir, and Concolor fir. We have hand saws available if you desire to Choose and Cut your own tree. Handmade and custom-designed wreaths are created daily with greens grown on our farm. Enjoy complimentary hot chocolate and candy canes in a relaxed and festive setting by our fire pit. Visit with Santa and write your letter to him in our Christmas playhouse! It's a great family experience! You-Choose and You-Cut varieties: Canaan Fir, Colorado Blue Spruce, White Fir (Concolor Fir), Douglas Fir, Eastern White Pine, Norway Spruce, White Spruce, and other varieties (call!). Living, rooted tree varieties: Canaan Fir, Colorado Blue Spruce, White Fir (Concolor Fir), Douglas Fir, Eastern White Pine, Norway Spruce, White Spruce. Market Lawrenceville-Pennington Road, Pennington, NJ. Phone: 609-737-6502. Directions: Route 546 at Federal City Road. Open: Daily, May to December, 10 am to 6 pm. Also: roadside market: Strawberries; sweet corn; tomatoes; peaches; various other fruits & vegetables; pumpkins. WIC and Senior FMNP checks accepted. 1312 Old York Road Route 539, 2 miles north of Route 195 (exit 8), Robbinsville, NJ 08691. Phone: 609-259-8122. Email: intrees@gmail.com. Directions: Route 539, 2 miles north of Route 195 at Exit 8. NJ Turnpike to Exit 8- Route 33 west to T, make left and go to Ward Avenue and make left (Getty Gas on right and Hightstown Diner on left), go 1 block to stop and make right onto Route 539 south. Proceed 4 miles to farm on right, just past Sharon Road. Farm is 5.2 miles from Exit 8 of NJ Turnpike. or Route 130 to Windsor Road, to end. Make left on Sharon road, farm is on right. Click here for a map and directions. Open: Click here for current open hours, days and dates. Our products are usually available in December. Open: 9 am to 5 pm (Friday, Saturday and Sunday), December to December 23. Payment: Cash, Check. 2006 and 2001 State Grand Champion Tree Farm. Best trees in Central New Jersey. Friendly, helpful service, snacks and fun. You-Choose and You-Cut varieties: Canaan Fir, Colorado Blue Spruce, White Fir (Concolor Fir), Douglas Fir, Eastern White Pine, Norway Spruce, Scotch Pine, White Spruce. You Choose and We cut varieties: Canaan Fir, Colorado Blue Spruce, White Fir (Concolor Fir), Douglas Fir, Norway Spruce, White Fir (Concolor Fir), White Pine, White Spruce. Living, rooted tree varieties: Blue Spruce, Canaan Fir, Douglas Fir, Norway Spruce, White Pine, White Spruce. 87 Federal City Rd, Lawrenceville, NJ 08648. Phone: 609-818-1140. Fax: 609-482-3617. Email: oasisgardencenter1@gmail.com. Open: Monday to Saturday, from 8 am to 6 pm; Sunday, from 9 am to 5 pm. Directions: Click here for a map and directions. Payment: Cash, Debit cards, Visa/MasterCard, Discover. Click here for our Facebook page. PreCut varieties: Balsam Fir, Douglas Fir, Fraser Fir, Noble Fir, Nordmann Fir. 47 Pleasant Valley Road, Titusville, NJ. Phone: 609-730-1110. Directions: From Lambertville South Rte. 29 Pleasant Valley Road. 8/10 mile left. From Trenton North 579 Bear Tavern Road 3 and a half miles on Pleasant Valley Road farm on right. Open: 9 am to 3:30 (Saturday and Sunday), December 2 to 17. U-Choose & Cut your own: Blue Spruce, Norway Spruce, Douglas-fir, Fraser Fir, Scotch Pine. 330 Cold Soil Road, Princeton, NJ 08540. Phone: 609-924-2310. Email: info@terhuneorchards.com. Open: All Year Seven Days a Week; Monday to Friday from 9 am to 6 pm and Saturday to Sunday from 9 am to 5 pm. Click here for current open hours, days and dates. Updates: Click here for updates. Directions: Click here for a map and directions. Payment: Cash, Check, Debit cards, Visa/MasterCard, Discover, WIC Vouchers, SFMNP Vouchers. Click here for our Facebook page. Santa visits on a few select days - see thier website. 35 Orchardside Dr, Cranbury, NJ. Phone: 609-799-1855. Email: info@barclaystreefarm.com. Open: 9 am to 5 pm (Saturday and Sunday), Saturday after Thanksgiving to December 24. Directions: NJ Tpk. Exit 8A - W. on Rte. 32 - 1 mile to Rte. 130 - South 1 point 6 mi., right on Dey Road - 2 miles to right on Orchardside Dr. From Rte. 1 N. of Princeton, E. on Scudder's Mill Road - 2 miles to a left on Dey Road, 2.3 miles to a left on Orchardside Dr. (Just past Blossom Hill Farm.) Click here for a map. We do not accept credit or debit cards. We do allow dogs on the farm, provided they are on a leash. U-Choose & Cut your own: Blue Spruce, Norway Spruce, White Pine, Douglas-fir, Fraser Fir, Canaan Fir. 255 Rhode Hall Road (Rte. 522), Monroe Twp., NJ. Phone: 732-521-2718. Directions: Exit 8A - go towards Cranbury, 1/4 mile right to Rte. 535 - 2 miles - right on Rte. 522 - 1/4 mi to farm. From Rte. 130 - Dayton Jamesburg Exit - left on Rte. 522 - straight 3 and 1/2 miles to farm. Open: 9 am to 5 pm (Saturday and Sunday), Saturday after Thanksgiving to December 19. Rt. 9 and Jake Brown Rd , Old Bridge, NJ 08857. Phone: 732-721-5728. Open: Palm Sunday to Christmas, daily from 9 am to 6 pm. They have a great selection of pumpkins in their farm market building or you can take a hay ride out to the field and pick your own. Their market also has Holiday Plants & Flowers, Pumpkins, Sweet Potatoes, Ornamental & Unique Gourds, Squash, Straw, Grave Covers, Wreaths, Trees. We offer Christmas trees, wreaths, swags and kissing balls to decorate your home. Our fresh cut trees range from 12' tall and full to tabletop trees. We have Blue Spruce, Douglas Firs, Fraser Firs and Concolor for you to choose from. We have customized wreaths, swags and kissing balls that can suit your style from classic country to city chic. Our designers will individualize each piece to complement your home and style. Come in and pick your colors, bows and style and we will create the perfect greenery for you. Also we have beautiful poinsettias, pine roping and assorted Christmas decorations. 191 Highway 34, Matawan, NJ 07747. Phone: 732-583-6780. Open: Palm Sunday to Christmas, daily from 9 am to 6 pm. Their market also has Holiday Plants & Flowers, Pumpkins, Sweet Potatoes, Ornamental & Unique Gourds, Squash, Straw, Grave Covers, Wreaths, Trees. We offer Christmas trees, wreaths, swags and kissing balls to decorate your home. Our fresh cut trees range from 12' tall and full to tabletop trees. We have Blue Spruce, Douglas Firs, Fraser Firs and Concolor for you to choose from. We have customized wreaths, swags and kissing balls that can suit your style from classic country to city chic. Our designers will individualize each piece to complement your home and style. Come in and pick your colors, bows and style and we will create the perfect greenery for you. Also we have beautiful poinsettias, pine roping and assorted Christmas decorations. You Choose and We cut varieties: Colorado Blue Spruce, Douglas Fir, Fraser Fir, Norway Spruce. 190 Freshponds Rd, South Brunswick, NJ 08831. Phone: 732-257-2484. Fax: 732-257-3217. Open: Starting the day After Thanksgiving, we are open Monday thru Friday from 10 am to 4:30 pm and Saturday and Sunday from 9 am to 4:30 pm. Directions: Click here for a map and directions. Payment: Cash, Check. You Choose and We cut varieties: Blue Spruce, Canaan Fir, Colorado Blue Spruce, White Fir (Concolor Fir), Douglas Fir, Eastern White Pine, Fraser Fir, Norway Spruce, White Fir (Concolor Fir), White Pine. Living, rooted tree varieties: Blue Spruce, Colorado Blue Spruce, White Fir (Concolor Fir), Douglas Fir, Eastern White Pine, Fraser Fir, Norway Spruce, White Pine. 315 Deans Rhode Hall Road, South Brunswick, NJ. Phone: (732) 297-0751. Open: 9 am to 4:30 pm on Friday, Saturday and Sunday, starting the Saturday after Thanksgiving to December 24. Directions: Coming from Route 1 & Route 130, South on Route 130 5 and a half miles to left on Deans Rhode Hall Road, 2.8 mi. ; Exit 8A to Route 535 North, 2.8 miles to Deans Rhode Hall Road. You Choose and We cut varieties: Blue Spruce, Norway Spruce, White Pine, Douglas-fir, Fraser Fir, Canaan Fir. 145 Dey Grove Road, Monroe Twp., NJ. Phone: 732-446-9799. Open: 9 am to 5 pm, daily, from the day after Thanksgiving to December 24. Directions: Freehold Circle to Rte. 33W for 6 and a half miles or NJ Turnpike Exit 8 to Rte. 33E for 5.5 mi., left (N) at Luchento's Ristorante, 2.4 miles left onto Dey Grove Road, 1.6 miles to farm. U-Choose & Cut your own: Blue Spruce, Norway Spruce, Douglas-fir, Fraser Fir. 238 Cranbury Station Road, Monroe, NJ 08831. Phone: 609-655-4175. Open: winter hours are December 1st Monday to Saturday 9 am to 5 pm, Sunday 10am to 4 pm. Directions: Click here for a map and directions. Payment: Cash, Check, Debit cards, Visa/MasterCard, WIC Vouchers. U-Choose & Cut your own: Blue Spruce, Norway Spruce, White Spruce, Douglas-fir, Concolor Fir, Fraser Fir, Canaan Fir, Balsam Fir. 114 Daum Road, Manalapan Township, NJ 07726. Phone: 732-786-9277. Email: sangilloandsons@optonline.net. Open: Thanksgiving Weekend and December 1st-23rd, from 9:30 am to 8 pm, daily. Directions: Rte. 9 S. from Old Bridge to Tennent/Englishtown exit. Tennent Road to Woodward Road to Daum Road Or Rte. 33 (E. 6 miles from Hightstown, NJ Tpk. Exit 8). (W. 5 miles from Freehold) to 527A North to Daum Road. And for a map to our farm, click here. Payment: Cash, Visa/MasterCard. Newly renovated gift shop. Grave blankets, kissing balls. Bring your family for a fun day of Christmas time activities. Take a walk around our farm while searching for the perfect tree. We have over fifty thousand trees to choose from. Once you select the perfect one, you can cut it down yourself or have one of our many skilled workers assist you. Then browse our Christmas Shop! Click here for a link to our Facebook page. You-Choose and You-Cut varieties: Blue Spruce, Douglas Fir, Norway Spruce, White Pine. PreCut varieties: Balsam Fir, Douglas Fir, Fraser Fir, Noble Fir. 83 Emleys Hill Road, Cream Ridge, NJ 08514. Phone: 609-758-8726. Email: janet@bullockfarms.com. Open: Wednesday through Sunday 9 am to 5 pm. Click here for current open hours, days and dates. Directions: Click here for a map and directions. Payment: Cash, Debit cards, Visa/MasterCard, Discover. Click here for our Facebook page. Our cut your own Christmas tree fields will be closed this year to allow them time to grow to a more suitable size. We will be offering pre cut Christmas trees this year. We are also the home of Screamin' Hill Brewery, open for tours and tastings on Fridays 3 PM to 5 PM, and Saturdays 12 PM to 5 PM. Please visit our website for more information. PreCut varieties: Blue Spruce, Canaan Fir, White Fir (Concolor Fir), Douglas Fir, Fraser Fir. * "Cut Your-Own" only available at our Burlington location. 3101 Hurley Pond Road, Wall, NJ 07719. Phone: 732-938-3782. Email: conoverfarm@yahoo.com. Open: To reserve a tree, starting the 1st Saturday in November 9 am to dusk; After the 1st Saturday you can reserve a tree Monday to Friday 10 am to dusk and Saturday and Sunday 8 am to dusk; We use a two part tag system, remove the perforated bottom of the tag to reserve a tree; To purchase your tree starting the Friday after Thanksgiving present the bottom of the tag to an attendant; No bottom of tag no tree! Purchase a tree Monday to Friday 3 pm to 6 pm Saturdays and Sundays 8 am to dark; After Thanksgiving you can choose a tree that has not been reserved and have it cut. Directions: Click here for a map and directions. Payment: Cash, Check. Click here for our Facebook page. We have about 3000 trees from 5ft to 16ft to pick from. A 5 to 6ft tree is $45.00. An 8 to 9ft tree is $63.00. An 11 to 12ft tree is $98.00. Any tree over 12ft is $118.00. This is a sampling of our prices. We have regular shaped trees, fat and skinny, dense and open trees. You Choose and We cut varieties: Blue Spruce, White Fir (Concolor Fir), Douglas Fir, Norway Spruce, Scotch Pine, White Fir (Concolor Fir), White Pine, White Spruce. 2170 Hwy. 35, Holmdel, NJ 07733. Phone: 732-264-0256. Fax: 732-264-0490. Email us at: info@dearbornmarket.com. Directions: We are conveniently located at the corner of Route 35 South and Centerville Road in Holmdel. We are just a few miles south of Garden State Parkway Exit #114 . And for a map to our farm, Click here. Click here for picking updates. Our products are usually available in September, October, November. Open: Monday through Saturday 8 am to 6 PM Sunday 8 am to 5 pm Hayrides run every weekend in October from 10 am to 5:30 PM. Visit our website Dearborn Market for events happening every weekend. Christmas Trees, Wreaths, Decorations, Gifts and Trim a Tree available starting after Thanksgiving through Christmas Eve. ( 12/24) We are certified organic for some crops. Payment: Cash, Check, Visa/MasterCard, AmEx. We have monthly events and specials which are updated monthly on our site. PreCut varieties: Balsam Fir, Blue Spruce, Colorado Blue Spruce, Douglas Fir, Fraser Fir. Living, rooted tree varieties: Blue Spruce, Douglas Fir, Fraser Fir, Norway Spruce, Ponderosa Pine, White Pine. 251 Oak Glen Road, Howell, NJ. Phone: 732-938-6348. Directions: East of Route 9, West of Herbertsville Road. Open: 12 to 4:30 pm (Monday to Friday), 9 am to 5 pm (Saturday and Sunday), November 29 to December 21. 257 Route 539, Cream Ridge, NJ 08514. Phone: 609-758-7500. Email: Thegoodearthnursery@gmail.com. Open: 7 days a week, from 8 am to 9 pm, Friday after Thanksgiving to December 24th. Directions: We're located approximately one mile north of the intersection of 537 & 539 and approximately one mile south of the Cream Ridge Golf Course. Click here for a map and directions. Payment: Cash, Check, Debit cards, Visa/MasterCard, Discover, AmEx. Click here for our Facebook page. PreCut varieties: Balsam Fir, Blue Spruce, Douglas Fir, Lodgepole Pine. Living, rooted tree varieties: Blue Spruce, Leyland Cypress, and other varieties (call!). 93 Squankum-Yellowbrook Road, Farmingdale, NJ. Phone: 732-938-7748. Directions: I-195 to exit 31 B, left at light, 1/2 mile on left hand side. Open: 10 am to 3 (Saturday and Sunday), Saturday after Thanksgiving to December 23. 842 Rte. 524, Allentown, NJ. Phone: 609-259-0720. Directions: Exit 8 of I-195 (hightstown/Allentown exit). Immediately onto Rte. 524. Farm faces I-195. 1 mile East of NJ Turnpike Exit 7A. Open: 8-5, daily, from November 20 to December 24. We are a family owned and operated, third generation, 24-acre Christmas tree farm in Allentown, New Jersey. We sell choose-and-cut trees by the foot, balled trees, fresh pre-cut North Carolina Fraser Fir, wreaths and roping. We are open daily November 17th thru Christmas Eve. Our wonderful Christmas shop is a winter wonderland of artisan made crafts, decorations and holiday gifts. Visit with Santa, sip on hot cocoa, and visit us for a real New Jersey farm experience this holiday season! U-Choose & Cut your own: Blue Spruce, Norway Spruce, White Pine, Douglas-fir, Concolor Fir, Fraser Fir. 523 Newman Springs Road, Lincroft, NJ. Phone: 732-747-4381, Fax: 732-741-2754. Directions: GSP Exit 109, W on Route 520 1/4 mile Garden State Pkwy Exit 109, travel W on Rte. 520 (Newman Springs Rd). Farm is located 1/4 mile west from the Garden State Pkwy. on Rte. 520. Email: billpatkohl@aol.com Open: 11-5 (Monday to Friday), 9 am to 5 pm (Saturday and Sunday), November 24 to December 23. 525 Route 9 South, Manalapan, NJ 07726. Phone: (732) 851-4400. Email: Mapleleaffarms@optonline.net. Open: Monday to Saturday 9 am to 6 pm, Sunday 9 am to 5 pm pm. Directions: Click here for a map and directions. Payment: Cash, Check, Debit cards, Visa/MasterCard, Discover. Click here for our Facebook page. 60 Birdsall Road, Farmingdale, NJ. Phone: 732-938-7181. Email: drbirdsall@msn.com. Open: UPDATE for 2018, Their website is gone; Does anyone have current information, are they still in business and open? If so, please write me, their last reported hours were 9 am to 4 (Saturday and Sunday), Saturday after Thanksgiving to December 19. Directions: 1/2 mile south of Farmingdale on Rte. 524. Left on Birdsall Road. First farm on left. U-Choose & Cut your own: Blue Spruce, Norway Spruce, White Pine, Douglas-fir. 636 Adelphia Road, Freehold, NJ 07728. Phone: 732-431-5271 . Fax: 732-462-8939. Email: pattersonghs@aol.com. Directions: We are located on Adelphia Road/route 524, half way between Route 9 and Farmingdale. And for a map to our farm, Click here. Our products are usually available in November, December. Open: Monday to Saturday, 8:30 am to 5 pm, Sunday 9 am to 4:30 pm; We start early tagging on Christmas trees the day after Thanksgiving and you can pick out and pick up trees from then until 4:30 pm on December 23. Payment: Cash, Check, Visa/MasterCard. Click here for a link to our Facebook page. You-Choose and You-Cut varieties: Colorado Blue Spruce, Douglas Fir, Norway Spruce. You Choose and We cut varieties: Colorado Blue Spruce, Douglas Fir, Norway Spruce. 288 Pleasant Valley Road, Morganville, NJ 07751. Phone: 732-740-4832. Alternate Phone: 732-740-5314. Email: PleasantValleyLavender@gmail.com. Open: Please call for availability and hours. Directions: Click here for a map and directions. We follow organic practices, but are not yet certified. Payment: Cash, Check. We have been selling Christmas trees here for nearly 20 years. Today we operate New Jersey's only Lavender Farm but we still have hundreds of beautiful evergreens available. Pleasant Valley Lavender has fresh (in season) Lavender, dried Lavender bundles, Lavender sachets, soaps, Lavender bath products, and delicious Lavender Honey. You-Choose and You-Cut varieties: Blue Spruce, Colorado Blue Spruce, Douglas Fir, Eastern White Pine, Fraser Fir, Scotch Pine, White Pine, White Spruce. You Choose and We cut varieties: Colorado Blue Spruce, Eastern White Pine, Fraser Fir, Scotch Pine, White Pine, White Spruce. 166 Hillsdale Rd, Colts Neck, NJ 07722. Email: Thefirfarm@gmail.com. Open: Saturday after Thanksgiving to Christmas eve, Friday, Saturday, Sunday from 10 am to 4 pm. Directions: Click here for a map and directions. Open for Christmas trees and wreaths from the Saturday after Thanksgiving until Christmas eve. We use natural practices, but are not yet certified Organic. Payment: Cash, Check. Click here for our Facebook page. We make all of our wreaths by hand starting around Thanksgiving. Just like no 2 trees are the same all of our wreaths are unique and we are always experimenting with new ideas. Get those special orders in early! You-Choose and You-Cut varieties: Blue Spruce, Colorado Blue Spruce, Douglas Fir, Fraser Fir, and other varieties (call!). 300 Rt. 33 W., Freehold, NJ. Phone: (732) 431-2668. Directions: 1 mile w of Rt. 9 on Business Rt. 33 Across from Battleground Park, click here for a map and more directions. Open: Year-round, Monday to Friday 9 am to 6 pm, Saturday and Sunday 9 am to 5:30 pm. Roadside Market: Produce; fresh fruit. Jersey Fresh Cooks cookbook; fresh baked pies; cider; cider donuts; hay rides through the apple trees and haunted orchards; corn maze in fall; hot air balloon launches; beautiful scenery; winery & wine tasting; gift shop; fresh flowers; mums; bedding plants; gourmet jellies; school tours; Morning on the Farm Summer Camp Tours. Click here for our Facebook page. 725 Route 524, Allentown, NJ 08501. Phone: 609-259-2186. Email: ajkb2@verizon.net. Open: Fridays, Saturdays and Sundays from November 26 to December 24; 9 am to 5 pm. Directions: Click here for a map and directions. Payment: Cash, Check, Visa/MasterCard.We have Douglas Fir, Blue Spruce and Norway Spruce. Be sure to pick up some beautiful wreaths to brighten your door or a kissing ball to liven up the holiday. We also have a good selection of grave blankets and pillows to remember loved ones. Come ride the wagon and enjoy the music to the field. If the weather is cool don't miss the free hot choclate and cookies. Also warm up in the greenhouse while you shop for poinsettias and holiday decorations. U-Choose & Cut your own: Norway Spruce, Scotch Pine, White Pine, Douglas-fir, Fraser Fir, Concolor Fir. 4409 Belmar Wall, Wall, NJ 07753. Phone: 732-319-4478. Email: robinsworth@gmail.com. Open: weekends 9 am to 5 pm; Weekdays 3 pm to 5 pm, or call to make sure we are around. Directions: Located between route 18 and the Garden Sate Parkway. Click here for a map and directions. Payment: Cash, Check. We sell festive wreathes, decorated grave blankets, seasoned firewood. Dogs are welcome. Also called Evergreen Lane Christmas Tree farm. YouYou-Choose and You-Cut varieties: Balsam Fir, Blue Spruce, Canaan Fir, Douglas Fir, Fraser Fir, Scotch Pine, White Pine, White Spruce.